Given that these cauldrons survived for over 2,000 years, it should come as no surprise that they were built to last. The discovery marks the largest grouping of early cauldrons ever found in Europe. One cauldron features a handle plate in the form of a cow's head; zoomorphic decoration is otherwise unknown on a British cauldron. "Analysis of the interiors of the cauldrons has even revealed traces of animal fats, a tantalizing suggestion that these objects might have been used in cooking and serving meat-rich stews at Iron-Age feasts over 2,000 ago," Julia Farley, curator of European Iron Age collections at the British Museum, told Discovery News. Farley's colleague Jody Joy, as well as Alexandra Baldwin and Jamie Hood from the museum, are still studying the artifacts, which were found buried in a 6.6-feet-wide pit. The cauldrons were made from iron and copper alloy in the second or first century B.C. Each was built to last, with an iron rim and band supporting circular suspension handles. The main body of the cauldrons consisted of a central band and bowl of sheet copper alloy riveted together. 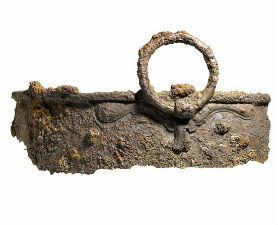 "The iron rim and handles gave strength and rigidity, while the copper-alloy bowl acted as an excellent heat conductor," the researchers note. When the cauldrons were buried, nearby Barbury Castle still might have been occupied. Another hill fort, Liddington Castle, likely had been abandoned. Nevertheless, given the possible fort protection and open space, "Chiseldon looks to be an ideal meeting place," the researchers believe. What the cauldrons were last used for is a bit of a mystery, but Joy and team suspect "large quantities of food and drink were probably consumed." Feasts at the time "would have marked significant events in the calendar or special occasions, such as marriages." Beef was the star attraction at the last big feast involving the cauldrons, the evidence suggests. The two cattle skulls, cow cauldron decoration and traces of animal fats all theoretically point to beef. But the experts say it's too soon to make that conclusion. Archaeologist Mike Pitts, who also edits British Archaeology, told Discovery News that "notwithstanding the cattle skulls, it might well have been pork. Pigs were important animals in feasting. Of course, whatever was in the cauldrons was boiled." While the British are now renowned for beef dishes, with the Tower of London ceremonial guardians even known as Beefeaters, beef wasn't always so popular and widely available, Pitts said. "Roast beef as a national dish really took root in the 18th century, which is also when 'les rosbifs' apparently became popular in France as a nickname for the English," he said. Farley agreed, saying, "Iron Age people also ate pig, sheep, and occasionally horse. Indeed, pork seems often to have been favored for feasting." DNA testing of the lipids in future could solve the mystery.